Austin Dillon went from fourth to first during an overtime finish that resulted in the Richard Childress Racing driver celebrating his second Monster Energy NASCAR Cup Series victory at Daytona International Speedway. Dillon acquired the lead after making contact with the bumper of the No. 10 of Aric Almirola, who attempted to hold his position by moving in front of the No. 3 Dow Chevrolet. Dillon’s win comes in the same number the late Dale Earnhardt won the prestigious event 20 years ago. Darrell Wallace Jr. finished second in his Daytona 500 debut racing for Richard Petty Motorsports. Wallace is the first African American driver to race full time in the Cup series in 47 years. Former Daytona 500 winners Denny Hamlin and Joey Logano finished third and fourth, respectively, while Chris Buescher rounded out the top-5. Ryan Blaney finished seventh after a dominate performance. The Team Penske driver led 118 laps before being involved in a multi-car wreck on Lap 199. His teammate Brad Keselowski finished in the 32nd position after being involved in a seven-car crash on Lap 102. The Monster Energy NASCAR Cup Series head to Atlanta on Sunday, February 25, 2018. Kevin Harvick beat Kyle Larson one year ago. Who will win this year’s Folds of Honor QuikTrip 500? Tune into FOX next Sunday at 2 p.m. ET to find out. When the Monster Energy NASCAR Cup Series rolled into Daytona International Speedway Ricky Stenhouse Jr. wasn’t one of the most talked about, despite his win at its sister track Talladega two months ago. But he was the one with all the glory Saturday night. Stenhouse propelled himself to victory in overtime to earn his second career victory this season. A feature no one could have predicted, but everyone can appreciate. Stenhouse started beside David Ragan on the restart after a incident involving Denny Hamlin and Erik Jones brought out the caution. Ragan gained the lead, but Stenhouse quickly made his way to the front for the top spot. Stenhouse won the Coke Zero 400 in a brand new car that Roush Fenway built for him. The car that he won with at Talladega was gifted to Stenhouse by team owner Jack Roush for his first career MENCS victory. Stenhouse is one of five drivers that have multiple wins this season. He sits 16th in the standings with nine races to go in the regular season. The race was plagued with several multi-car accidents that left many of the favored contenders with finishes of 20th or worse. Dale Earnhardt Jr. was involved in a wreck on Lap 52 after he felt one of his tires was losing air. That turned out to be a false alarm, however he made contact with Paul Menard and was two laps behind the leaders. Earnhardt just received the free pass before being collected in a crash after a blown tire sent the No. 4 of Kevin Harvick spinning. Stage 1 winner Brad Keselowski was also involved, ending his night with a finish of 31st. In the chaotic night the top 10 finishers of the night were practically unrecognizable. Paul Menard, Michael McDowell, and Xfinity Series regular Brendan Gaughan all claimed finishes inside the top 10, with BK Racing’s Corey Lajoie just outside in 11th place. The Monster Energy NASCAR Cup Series head under the lights again at Kentucky on July 8, 2017 at 7:30 p.m ET. 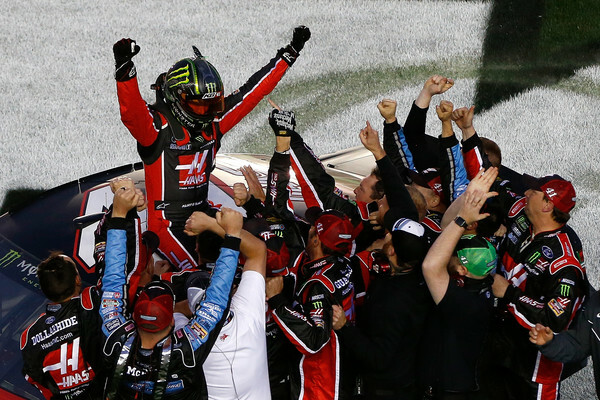 2004 Monster Energy NASCAR Cup Series champion Kurt Busch can now add Daytona 500 champion to his resume. The Stewart-Haas Racing driver acquired the lead on the last lap of The Great American Race, and despite reports that he would be short on fuel, made it to the end .228 seconds ahead of the No. 21 of Ryan Blaney. Busch led only one lap Sunday afternoon, but it was by far the most important one. Busch, who is sponsored by the new series title sponsor, persevered with a damaged car and a missing rear view mirror in the final stage of the historic event. And he did. Busch gained the momentum that his fellow drivers while running out of fuel. Pole sitter Chase Elliott finished 14th after falling short of fuel on the final lap. Busch’s brother, Kyle Busch, won the first 60-lap stage but spun on Lap 105 because of a punctured tire. He collected teammate Matt Kenseth and NASCAR’s most popular driver, Dale Earnhardt Jr., who was racing for the first time since July after missing the second half of the 2016 season due to a concussion. Earnhardt took his Nationwide Chevrolet to the garage and finished in the 37th position. Stage 2 winner Kevin Harvick was involved in a multi-car wreck on Lap 128 when Jamie McMurray made it four wide, causing the defending champion Jimmie Johnson to spin. The incident was the cause of the eventual race winner’s damage that also destroyed the No. 14 of Clint Bowyer. The newlywed driver, who married his wife Ashley in the offseason, brought Stewart-Haas Racing it’s first Ford victory since making the manufacturer switch. The win is the 29th of Busch’s career and the first for co-owner Tony Stewart since retirement. 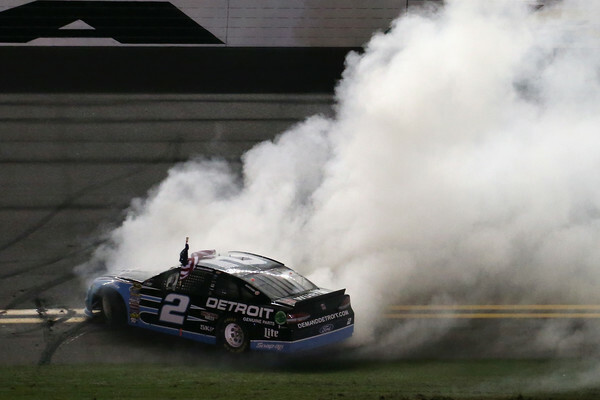 Brad Keselowski knows his way around restrictor-plate tracks, scoring five victories since his Sprint Cup start in 2009, so it’s no surprise that he dominated his way to victory lane during the Coke Zero 400 at Daytona International Speedway. Keselowski led 115 of 161 laps while avoiding damage from multiple wrecks Saturday night before capturing his first win at Daytona. The victory is also Penske’s 100th Cup victory. “It’s been a kick in the you-know-what,” Keselowski said about scoring the Daytona victory, “I got down on myself here. We came down here for the 500 and quite honestly we ran like dog crap, but my team worked on it. I didn’t give up on them. Although Keselowski has had little to no success at Daytona, his continued effort has helped him gain more knowledge on what to expect at Daytona and its sister track, Talladega Superspeedway. Keselowski, with the help of his teammate Joey Logano, held off Kurt Busch and Kyle Busch in NASCAR overtime for his 20th career Cup win, which happened to be during Keselowski’s 250th Cup start.